I want to wish everyone a nice weekend and I thought that I would share with you a recipe that I found in a cookbook called Crock Pot Cookbook, By R. Wilson. 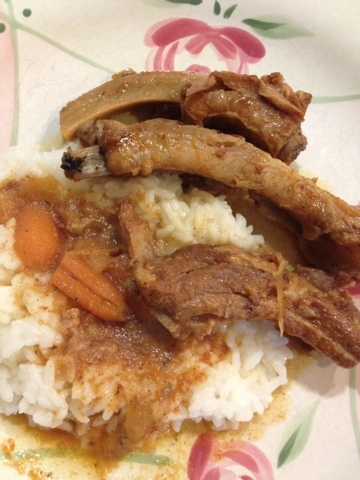 Here is the recipe for Crock Pot Pork Ribs that our friends Rudy and Alina asked for a few weeks ago. It is an easy recipe to make and is good served with any kind of rice. Mix together all the ingredients together. In the pot put all of the vegetables and then add the ribs. Pour the marinade over the ribs in the pot. Cook until tender. Cook for 1 hour on high and then about 4 hours on low. I hope you all try this recipe and let me know how it came out. Sorry this is the best picture that I have of the ribs. ooh I've been wanting to make something similar lately, now I must! Looks so good! Also I could probably eat white rice with everything so I can't wait to make it. Thank you for sharing this recipe with us. I will certainly try to make this soon. It should be delicious. These ribs looks so good, I can almost taste them! Thanks so much for sharing with Full Plate Thursday and have a great day!